Touhou is a franchise known chiefly for its genre-defining bullet-hell insanity. Team Shanghai Alice’s wholehearted embracement of fan-made games (“doujin” more accurately), though, has led to a bustling, open-ended franchise where creativity is bread and butter. Its characters have gone on to star in everything from unofficial anime to light novels, morphing stars of a niche genre into broader symbols for aspiring developers in Japan. Related reading: Clark reviews another Touhou game, Touhou Genso Rondo: Bullet Ballet. 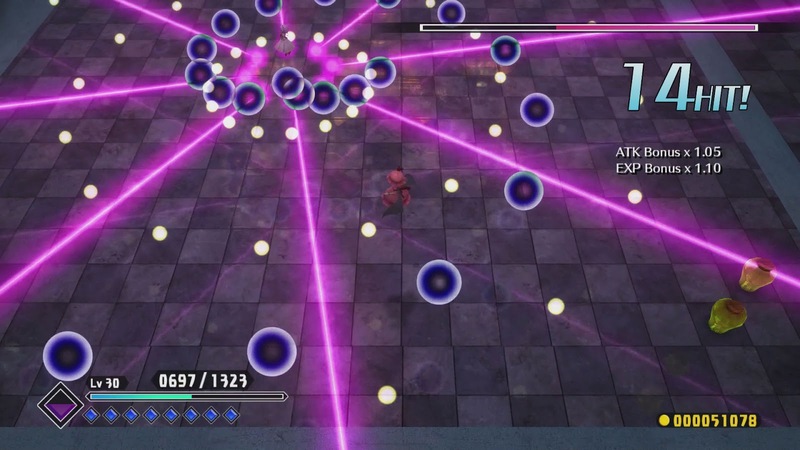 The experiments conducted by fans are most lucrative when they aren’t just leveraging the cutesy characters themselves but embracing the bullet-hell gameplay synonymous with the Touhou name. We saw recently with Touhou Genso Rondo: Bullet Ballet that fighting game and 2D shooting mechanics can work in harmonious unison. Touhou: Scarlet Curiosity, a doujin title from another studio, instead seeks to fuse the action RPG with the tried and true Touhou shooting formula. Though the fruits of its labour aren’t quite as ripe, the game does prove once again that grandiose bullet-hell gameplay can shine outside predictable contexts. Scarlet Curiosity contains a plot that is in line with most comedy-oriented Touhou releases. 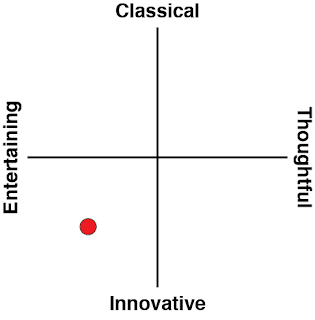 This is to say it’s amusing nonsense geared more toward existing fans than anyone else. Protagonist Remilia Scarlet has her curiosity piqued (yes, you can already guess where the title comes from) by a newspaper, which reveals that a monster is leaving destruction in its wake. Motivated not by heroic motives but sheer desperation to overcome boredom in her old age, Remilia sets out to vanquish the fiend. 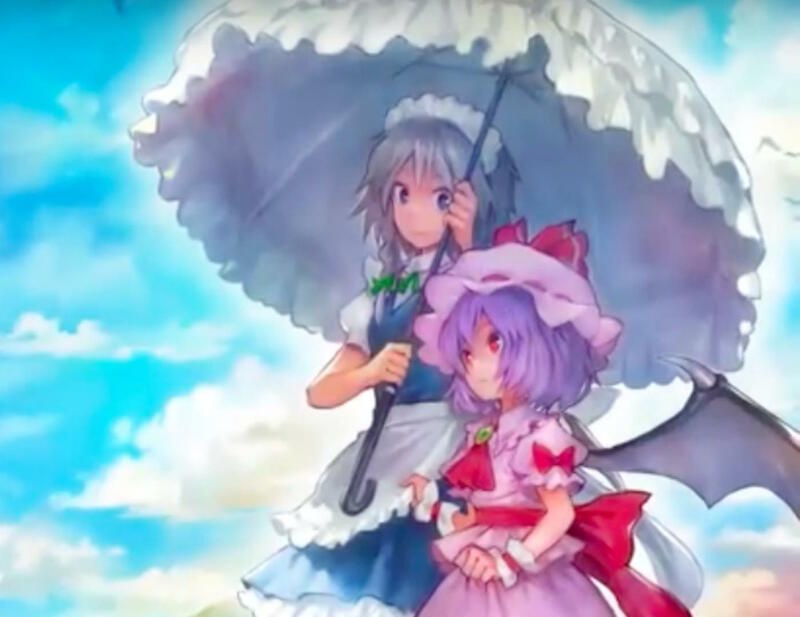 Players can also elect to play as Sakuya Izayoi, Remilia’s maid, whose outside perspective puts an equally appealing spin on the proceedings. You’re not going to witness oodles of enthralling dialogue during the game’s pleasantly brief running length. Each of the game’s loosely defined chapters does little to build real tension and, frankly, it suits the franchise’s tone all the better for it. It’s a title that accepts its own light-hearted nature off the bat. This winds up as a double-edged sword, however, in that the tale does little to tie in with the escalating JRPG mechanics beneath it and the gags aren’t plentiful or tightly written enough to stand toe to toe against the more comedic JRPGs out there. I can see newcomers being intrigued by the cultural elements such as shrine maidens, tengu, and shinigami, but then again, the same can be said of most canon or fan-made titles in the series. The neatest attribute here is the inclusion of mysterious newspapers clippings via the main menu, which add a touch of personality whilst helping direct the action. 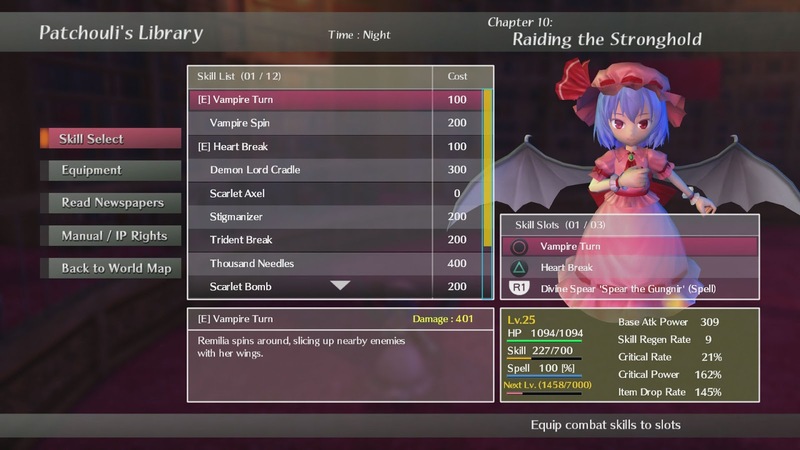 Thus, Scarlet Curiosity hands over most of the heavy lifting to the action RPG-influenced gameplay. The expected genre trimmings are all there, complete with levelling up, equipment management, and traditional combat. If you’re familiar with the bulk of Ys titles available on PSP and PC, you should feel right at home with the setup here. Racking up ludicrous combos increases your attack output and accelerates the rate of experience gain upon mowing down legions of foes. This encourages a faster paced, beat-down format similar to bullet hell games, albeit with the introduction of jumping not possible in those games. The real treat is learning new skills via levelling up and watching as these completely alter the game’s play style. Slicing up squadrons becomes infinitely more fulfilling when you’re constantly beta-testing skills to prepare for boss showdowns. What’s far more crucial to the formula is the injection of Touhou flavouring. This is where Scarlet Curiosity excels; introducing players to a genre mashup that precious few developers have ever toyed with. Unlike the aforementioned Ys series, you will not spend most of your time hacking and slashing but launching and dodging kaleidoscopic arrays of flashy projectiles. Combined with the rhythmic combo system that encourages precision, you can tell there was a concerted effort to preserve the building blocks of Touhou. You’ve even got the Spell attacks in those games, which trigger explosive damage at the appropriate expense of a meter that needs to be recharged. Melee attacks are also included in order to upkeep the tempo of a more traditional action game, but you’ll obviously want to experiment with the shooting mechanics here above all else. 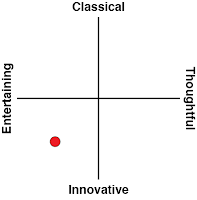 The resulting dynamic between the two genres is an intriguing one indeed, though there are some speed bumps in the proceedings. Just the ability to jump, a feature reasonably common in action RPGs, means you're going to get plenty of air-time. This permits players to tower above the ground-bound bullets and elemental attacks, providing a relatively simple counter versus having to dance like in a shooter. Enemy mannerisms also tend to be conservative, presumably to enable the use of physical attacks. Overall, there’s the sentiment that the frantic psychosis of the bullet-hell mechanics were downplayed. Scarlet Curiosity is by no means bland, but it feels as if the genres didn't truly fuse and cause the game to become its own entity. In other words, this one is more in the vein of Ys than Touhou as far mechanics go, but there’s no denying that the shooter flavouring does add contribute something worthwhile. Thankfully, the level design does have an identity of its own compared to fellow action RPGs. The world itself is broken into several smaller regions accessible through a world map. Stages tend to be these open-ended, sprawling mazes littered with alternate routes and sprinkled with foes for good measure. Because levels are broad but still have a loose sense of direction, players can decide whether to live fast and furiously or stop and sniff the roses. The latter option has plenty of merits, what with the myriads of sedentary treasure chests just begging to be scoured. Naturally, designs become even more enticing as the game progresses and by the end you'll find some borderline 2D stages to mix up the pacing as well as some 3D platforming-lite levels. The wonderful diversity keeps players on their toes and it’s fascinating to witness old circumstances familiar to action RPGs but with the power for players and foe alike to fire projectiles. Boss fights are closer in nature to Touhou's majestic bullet-hell bosses, but are also rather tame by comparison due to the jumping mechanic and downplayed enemy patterns. Nonetheless, some skirmishes toward the end do push ingenuity despite the limitations. The sheer novelty is forever on display. 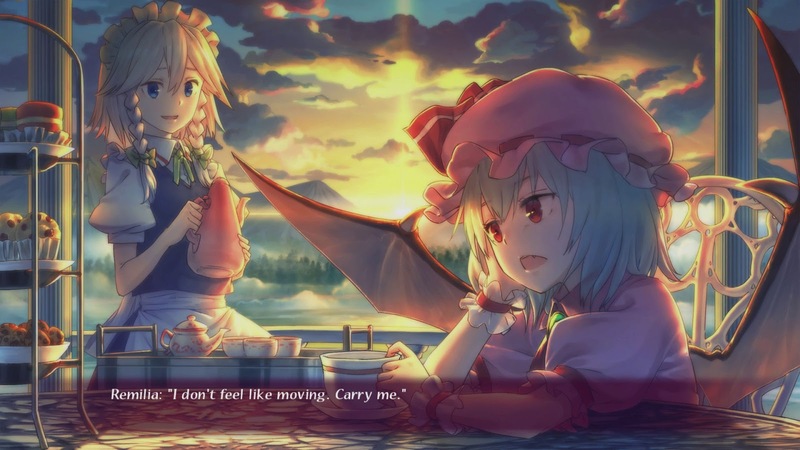 Touhou: Scarlet Curiosity doesn't merge its two genres as seamlessly as its recently localised sibling, but it’s still an exceptionally fresh curiosity buy. Though ultimately not quite as polished as either Ys or a main-series Touhou outing, the underlying gameplay is so clever it elevates the whole experience. The adoption of bullet-hell mechanics by classic genres continues to pay dividends.